The skin is a protective barrier, and an endocrine, sensory and thermoregulatory organ. We investigated whether the skin of local pigs had beneficial anatomical traits compared to exotic pigs to withstand the increased heat loads predicted under future climate change scenarios. Full-thickness skin specimens were obtained from the dorsal interscapular, lateral thoraco-abdominal and ventral abdominal regions of intact boars (age 6-8 months) of two local breeds of pigs (Windsnyer [n = 5] and Kolbroek [n = 4]) and an exotic pig breed (Large White [n = 7]). The skin sections were stained with a one-step Mallory-Heidenhain stain and Fontana stain (melanin). Sweat gland perimeter was measured using Image J software. The Windsnyer breed had the thinnest dermis layer while the Large White had the thickest dermis layer across all the three body regions (analysis of variance [ANOVA]; p < 0.001). The Windsnyers had widely spaced dermal pegs compared to the other breeds. The Windsnyers had significantly more superficial and larger (~1 mm depth; 4.4 mm perimeter) sweat glands than the Kolbroek (~3 mm depth; 2.2 mm perimeter) and Large White (~4 mm depth; 2.0 mm perimeter) pigs (ANOVA; p < 0.001). The Windsnyers had visibly more melanin in the basal layer, the Kolbroek pigs had very little and the Large Whites had none. The functionality of the sweat glands of the Windsnyer breed needs to be established. The skin from the Windsnyer breed possesses traits that may confer a protective advantage for the increased solar radiation and ambient temperatures predicted with climate change. Globally, climate change is predicted to result in spatial increases or decreases in surface temperatures and high solar radiation in the summer months. Based on the currently available data, the average world surface temperature increased by 0.8 °C (0.72 °C - 0.85 °C] when comparing the 1850-1900 and the 2003-2012 periods (Intergovernmental Panel on Climate Change 2013). South Africa lies partly in the tropics and already seems to be experiencing an increase in annual temperatures. It is reported that the average annual temperatures in South Africa have increased by at least twice the observed global average of 0.8 °C per decade reported in the Intergovernmental Panel on Climate Change (IPCC) Assessment Report No. 4 between 1960 and 2010 (Department of Environmental Affairs (DEA) 2013). Solar radiation considerably increases the environmental thermal load on animals during summer months (Spiers 2012). Studies on skin characteristics demonstrated that indigenous breeds of cattle (Bos indicus) in Australia (Pan 1962), sheep in Brazil (McManus et al. 2011) and the indigenous Creole pigs in the Caribbean (Renaudeau, Leclerck-Smekens & Herin 2006) tolerated heat stress better than the exotic breeds of livestock. It is not known whether the local pigs in South Africa also possess traits that may give them an advantage to cope with the high predicted thermal loads. 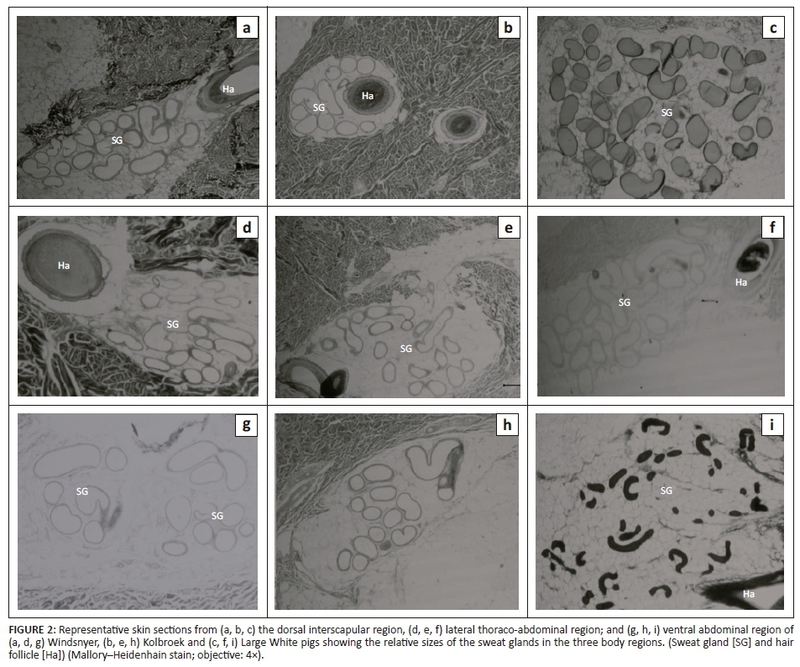 The study was a prospective interventional study that used randomly selected intact boars (Large White [n = 7], Windsnyer [n = 5] and Kolbroek [n = 4], 6-8 months old with a body mass of 58.8 kg ± 3.1 kg [Kolbroek], 59.6 kg ± 13.3 kg [Windsnyer] and 115.8 kg ± 18.7 kg [Large White]) to investigate the morphology of the skin. All pigs were purchased from the Agricultural Research Council (ARC) Station in Irene, Pretoria, South Africa (GPS Coordinates: -28.165430 S 28.306129 E). All pigs were kept in the Central Animal Services Farm Animal Unit at the University of the Witwatersrand (Johannesburg). They were fed a 15% crude protein soybean or maize meal-based pig grower diet enriched with vitamins and minerals (Epol, Johannesburg, South Africa) at 2% of total body mass of the pigs in each pen for maintenance of body mass. The food was moistened with water at the ratio of 2 x feed to 1 x water. Dry wheat straw provided bedding and was changed daily before feeding. A 12:12 light-dark cycle was used throughout the experiment, with lights on at 06:00. The ambient temperature in the farm animal unit was 23.0 °C ± 2.0 °C and relative humidity was 45.0% ± 5.0%; both were recorded with a data logger (Hobo U12-013 Temp/RH/2 External Data Logger, Onset Computer Corporation, Pocasset, MA, USA). In accordance with previous protocols (Debeer et al. 2013; Renaudeau et al. 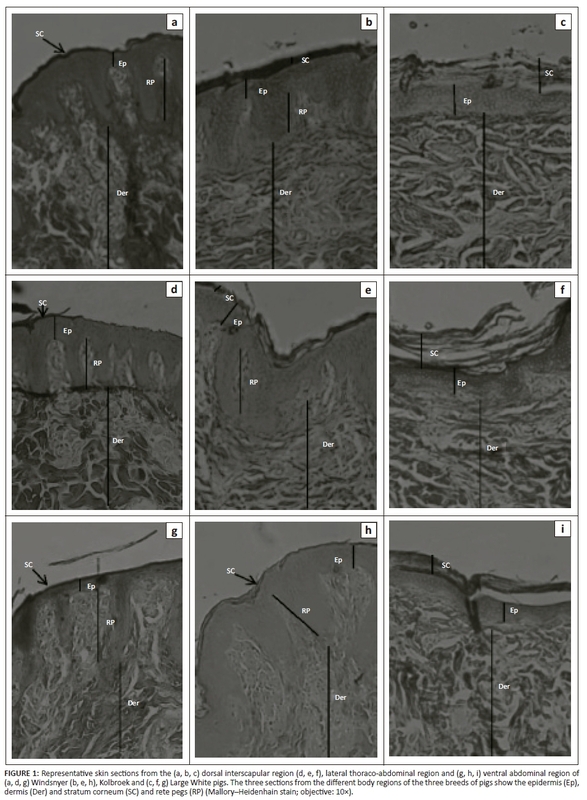 2006), full-thickness skin samples measuring approximately 20 mm × 20 mm were excised from the dorsal interscapular region, lateral thoraco-abdominal region and ventral abdominal region of the bodies of all the pigs. After excision, the skin samples were immediately fixed in 10% buffered formalin and then processed using an automatic tissue processor (Shandon Citadel 1000; Thermo Scientific, Germany). Thereafter, the samples were embedded in paraffin wax using a Tissue-Tek TEC 5 Tissue Embedding Console System (Sakura Finetek Europe B.V., Amsterdam, the Netherlands). Thin vertical sections measuring 6 µm in thickness were cut using a manually operated rotary microtome (Leica RM2125RT, Leica Biosystems, Nussloch, GmbH, Germany). The sections were floated in a water bath (Electrothermal MH8504, Stachwell Sunvic Ltd, London, Great Britain) set at 50 °C and containing tissue section adhesive (Sta-On, Surgipath Medical Industries Inc, Winnipeg, Manitoba, Canada). The sections were then placed on frosted glass slides and dried on a drying plate (Slide Warmer, Precision Scientific Co, Chicago, United States) at 50 °C to dry overnight. After dewaxing and rehydration, two sections from each of the three regions were stained for 5 min in an aqueous one-step Mallory-Heidenhain stain (Cason 1950), for the evaluation of general morphology. To show the melanin in the skin, the two sections from each of the three regions were stained with Fontana stain (Renaudeau et al. 2006) for 2 h in an oven at 60 °C. After staining, the slides were washed under running tap water until the water became clear and placed in 95% alcohol for 30 s, transferred to two changes of absolute alcohol for 30 s, followed by clearing in two changes of xylene for 2 min each. The slides were then mounted with a cover slip using Entellan (Merck, KGaA, Darmstadt, Germany) as a mounting medium. Sections stained with the one-step Mallory-Heidenhain stain were photographed under a low-power (0.75× [objective lens] and 10× [eye piece lens]) using a Nikon SMZ1500 Zoom Stereomicroscope (Nikon, Japan). The microscope was coupled with a digital colour camera (Nikon model DS-Fi1, Nikon) and a computer with board for digital capture Pixel View Play TV (1280 × 980 pixels) for image capture to allow for the measurement of the thickness of the dermis, epidermis and hypodermis. The morphometric software (Image J, NIH, http://rsb.info.nih.gov/ij/) was used to measure the thickness of the epidermis (µm), dermis and hypodermis (mm). 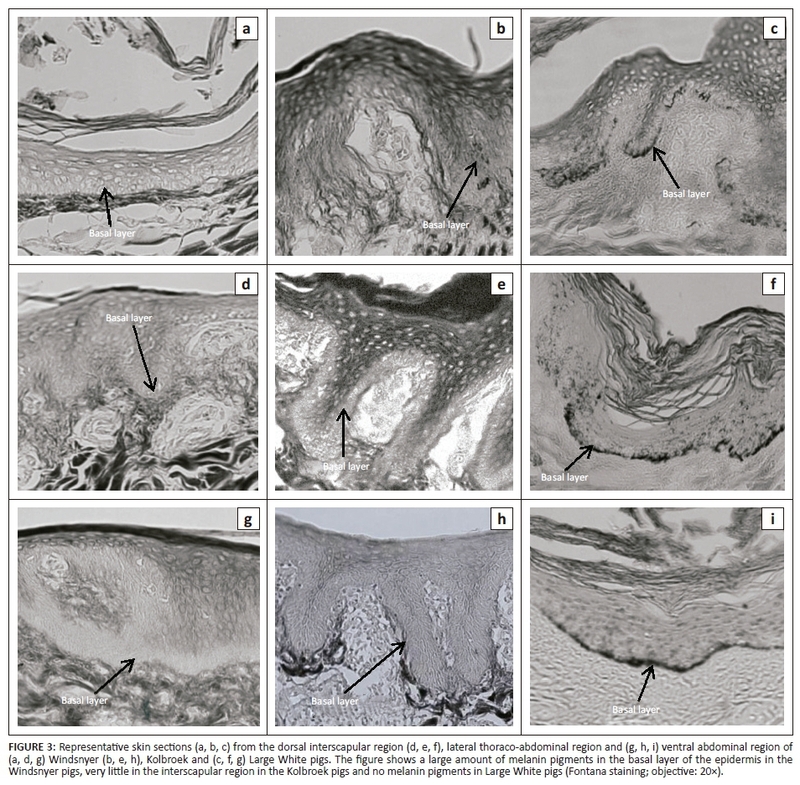 The epidermis was measured using Image J software at two different points: above the dermal papillae (the thinnest part of the epidermis) and from below the stratum corneum to the end of the rete peg (thickest part of the epidermis). Sections stained with the one-step Mallory-Heidenhain stain were also photographed under a low-power (4× [objective lens] and 10× [eye piece lens]) using a Nikon microscope. The microscope was coupled with a digital colour camera TV-Lens C-06X (Nikon) and computer with 'board for image capture' to allow for measurement of the perimeter and depth of the sweat glands using the morphometric software Image J. Sections that were stained with the Fontana stain were photographed under a low-power (20× [objective lens] and 10× [eye piece lens]) using a Nikon microscope for the observation of the melanin. Statistical analyses were performed using GraphPad Prism 6 (GraphPad Software, Inc., La Jolla, CA, United States). The data were analysed using repeated measures two-way analysis of variance (ANOVA) at 5% level. 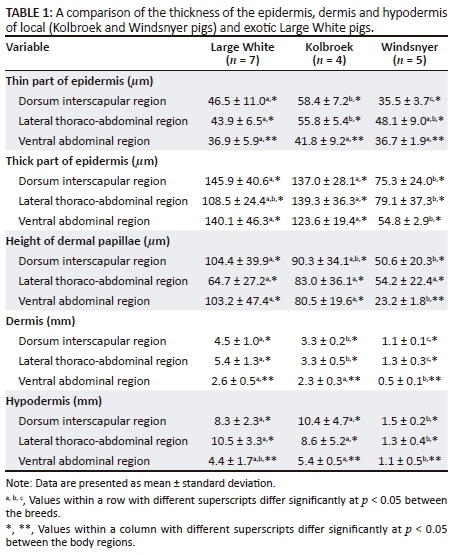 The thickness of the epidermis, dermis, hypodermis, height of the dermal papillae (or dermal pegs), size (perimeter) and depth of the sweat glands were compared between breeds across body regions. When the ANOVA revealed significant differences between the means, the Tukey's multiple comparison post-hoc test was performed to detect the differences in the anatomical traits between the breeds and between the three body regions within a breed. Values are reported as mean ± SD. p < 0.05 was considered statistically significant. The thick part of the epidermis was significantly different (F2,13 = 15.34; p = 0.0004) among the breeds with the Windsnyer having a significantly thinner part than the Large White (p < 0.0001) and Kolbroek (p < 0.001). The thickness of the thick part of the epidermis was not significantly different (p > 0.05) between the Large White and Kolbroek. In the dorsal interscapular region, there was no significant difference in the thickness between the Large White and Kolbroek (p > 0.05). However, the thick part in the Windsnyer was significantly thinner than in the Large White (p < 0.001) and the Kolbroek (p < 0.01). In the lateral thoraco- abdominal region, there were no differences in the thickness of the thick part of the Large White compared to the Kolbroek (p > 0.05) and Windsnyer (p > 0.05). However, the Windsnyer pigs' thick part of the epidermis was significantly less thick than that of the Kolbroek pigs (p < 0.01). In the ventral abdominal region, the thick part of the epidermis of the Windsnyer was significantly less thick compared to the Large White (p < 0.0001) and the Kolbroek (p < 0.001), while there was no significant difference in the thickness between the Large White and Kolbroek (p > 0.05). There were no significant differences (F2,26 = 0.78; p = 0.47) in the thickness of the thick part of the epidermis across the three body regions. There was no significant correlation between the breed of pig and body region (F4,26 = 1.58; p = 0.21). The thickness of the epidermis in pigs is reportedly quite variable. For example, thicknesses of 30 µm - 100 µm (Morris & Hopewell 1990) and 70 µm - 140 µm (Meyer, Schwarz & Neurand 1978) in Yorkshire and miniature pigs, respectively, have been reported. The thickness of the epidermis in both the local Windsnyer and Kolbroek and the exotic Large White pigs in the current study ranged between 35 µm and 146 µm, which is comparable with the values previously noted in Yorkshire and miniature pigs. The thickness of the epidermis plays an important role in heat tolerance. Previous studies on cattle and Indian buffaloes showed that those animals with a thin epidermis were found to tolerate heat stress better than animals with a thick epidermis (Saravanakumar & Thiagarajan 1992). The Windsnyer pigs had a thinner epidermis than the Large White and Kolbroek pigs, which may confer increased heat tolerance compared to those two breeds. The larger perimeter of the sweat glands in the Windsnyer pigs might suggest a greater capacity to lose moisture. In cattle, the sweating efficiency appears to be affected by the size, density, number and depth of sweat glands (Nay & Hayman 1956). Bos indicus cattle (which sweat more efficiently than Bos taurus) have been shown to have sweat glands that are significantly larger and more numerous than those in Bos taurus cattle (Pan 1962). It is important to note that most of the studies have found that sweat glands in domestic pigs are not functionally effective for thermoregulation (Ingram 1967). Sokolov (1982) stated that of the Artiodactyla studied, 'the sweat glands were best developed in the wild boar', the possible reason being that the wild boar has a thick subcutaneous fat layer that hinders heat transfer through the skin (Sokolov 1982). Given the findings in the wild boars by Sokolov (1982), it is feasible the local Windsnyer pigs might have active sweat glands, especially considering that the Windsnyer pig is reportedly closely related to the wild boar that has origins in Europe. It is important that studies on the sweat glands the Windsnyer pig be undertaken. The authors are grateful for the financial support of the Faculty Research Committee, University of the Witwatersrand, the National Research Foundation and the Oppenheimer Memorial Trust. The authors would also like to thank the members of staff of the Central Animal Services, University of the Witwatersrand for care and maintenance of the animals during the study. In addition, Mr Zipho Zwane is thanked for assisting with the feeding and weighing of animals during the trials. Dr Robyn S. Hetem is thanked for her helpful comments on this manuscript. Prof. Paul Manger's role in assisting with the use of Image J software and Mrs Hasiena Ali's technical assistance with the processing of slides and photographing are also greatly appreciated.